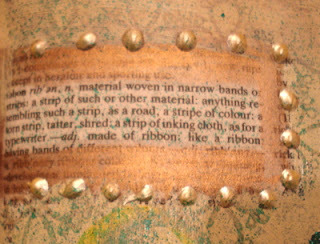 Hi everyone just a quick post to show my latest dictionary page for the ALPHA challenge over at The Craft Barn. 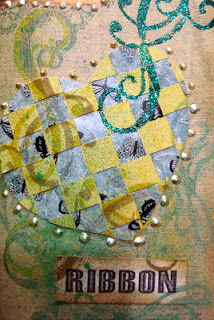 The letter this week is R and I chose RIBBON as my word. I missed the last letter but my M page is on the wall of fame at Craft Barn, woo hoo!! 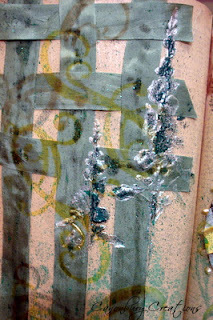 I applied acrylic paint over both pages and when it was dry I added some distress inks and on the left side I added strips of ribbon woven and stamped flourishes over the page. I also used paste on a stencil and added glitter and some glimmer spray. I took two different backing papers, cut them into strips, wove them together and cut a heart out of the finished weave. The heart is amazing. Lots of interest with colour and texture. Great pages, love the fabulous woven heart. Love the woven heart Val - gorgeous texture and colours too. These pages are beauties! Love all the woven ribbons and the swirls that set it all off! this is sooo cool, I luv the challenge..hope you have a wonderful weekend! It is really interesting to see these dictionary pages and this one is beautiful with the woven effect. Great pages & I love the weaving. Well done on getting onto our wall of fame, well deserved Val! 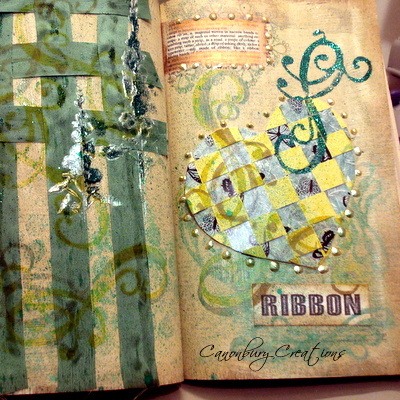 I love your ribbon weaving, fab page! Great idea to choose ribbon - the weaving looks great! A lovely job Val.....that weaving looks really fiddly, but very effective! Such amazing texture on these pages. Love how the shiny bits catch the light. The woven heart is a great detail. Love the colour and texture on these ribbon pages, fabulous. 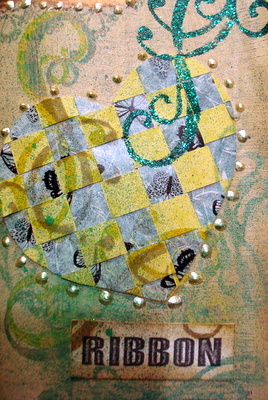 Wonderful weaving and embossing on yourncool,pages. Beautiful pages Val, I love the details and colours.